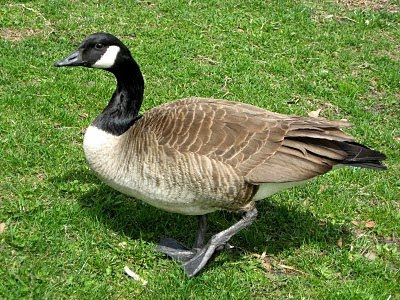 This year we seem to have more migratory Canadian Geese that ever before. We do understand why we have so many more geese than in previous years maybe it was related to the very cold December north of Colorado? The damage we have received is extensive in small areas, and the goose poo is everywhere. We are more concerned about desiccation in the areas the geese have eaten. The geese eat the top layer of turf exposing the crown. This top layer of turf helps hold in much needed moisture to keep the crown hydrated. Now with the lack of snow cover in these areas and minimal turf we have to water the areas and try to cover them back up with snow. Our preventative measures are still working by using bird bangers basically fire works. This is at least keeping the geese somewhat under control. These loud noise makers keep the geese moving on. But with such large numbers it is difficult to keep all of them off the course. Probably the most interesting fact of the Canadian Goose is the flying V formation. 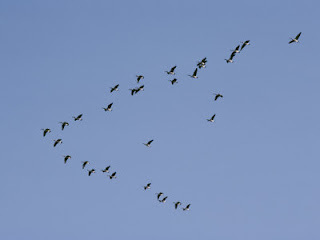 The V formation does not necessarily point the way the geese are going but it has to do with air resistance. The first bird in formation breaks up the wind creating less drag. During their flight the birds change positions until all of them have taken the front position. This keeps the birds form getting over tired.